The Maloof Money Cup Pro Qualifiers consisted of 30 professional skaters from all over the world including The U.S., Canada, Singapore, Thailand, France, and Germany just to name a few. Dlamini Dlamini and Moses Adams represented South Africa and held it down! Unfortunately Moses Adams didn’t qualify for the top 12 that advance to skate the finals but was only a few spots behind. Dlamini Dlamini threw down a few hammers including frontside flip down the big 4 along with switch lip down the rail. MMC SA 2011 runner up and Durban-born Tommy Fynn kickflip crooked grinded the rail and earned a spot in the finals as well. The Baker crew was steady crushin’ it, with The Boss, Bryan Herman, and Figgy all qualifying for the finals. Crowd favorite Lizard King threw a backside 180 one foot over the rail along with a gang of other tricks, but wasn’t enough for him to qualify. 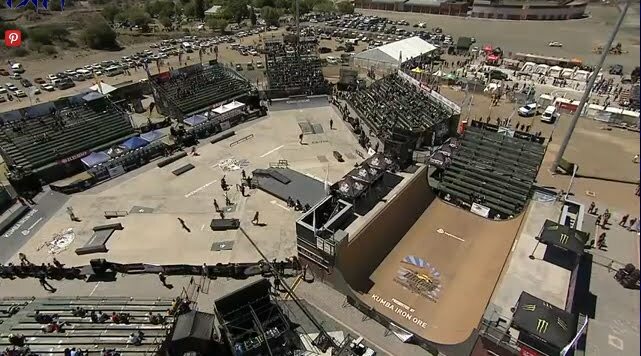 The level of skateboarding of the top 4 was beyond mindblowing. We’ve concluded that Felipe Gustavo, Ryan Decenzo, Micky Papa, and especially Luan Oliveira are from another planet. These guys are automatically seeded in the 2nd round of the bracket of tomorrow’s pro finals. Felipe’s flawless style and trick difficulty put him in the finals. Although some of his raddest skating always goes down during practice, he held it down! Luan barely fell and threw out the most variety and consistency in his runs, putting him in first. Some of our favorites were his alley oop backside flip and switch fs flip on the quarter. Micky Papa killed the big 4 with varial heel, tre flip, and bs overcrook, to name a few. Ryan Decenzo put on a show with his sw 270 to frontside board along with a slew of other tricks, landing him 2nd place in the qualifiers. Check the results and photos below. See you tomorrow for the finals!